The number of incidents in which police used Tasers has increased as more officers get the authority to use them, the Home Office says. The stun weapons were used by officers in England and Wales 252 times between September 2007 and February 2008 - 236 in the last three of those months. Of these, the 50,000-volt weapons were discharged by officers 31 times. In other cases drawing or aiming the Taser had a deterrent effect, says the government. Ten police forces have been taking part in a 12-month trial, where Tasers have been used by specially-trained units, who are not firearms officers. "Tasers have contributed to resolving incidents without injury where otherwise there would have been a real possibility of someone being seriously injured or killed," said Home Office minister Tony McNulty. "In most cases they have not needed to be fired; drawing or aiming the taser has been enough of a deterrent. "Protection of officers and members of the public is clearly our highest priority. 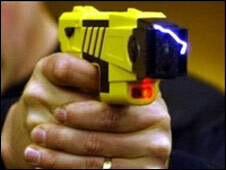 The government will be closely monitoring the trial to evaluate Tasers' benefits against any risks." Human rights group Amnesty International has raised concerns, claiming that three deaths in the United States have been linked to the use of Tasers - though police in the US deny this and say other factors were to blame.